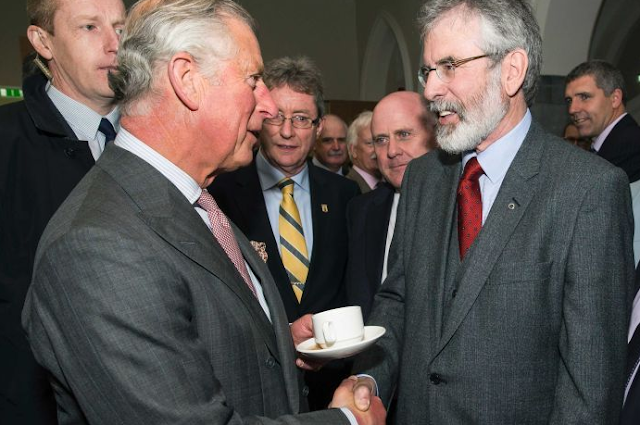 Earlier today Prince Charles shook hands and met with Gerry Adams. Adams is an Irish Republican Politician and President of Sinn Féin. 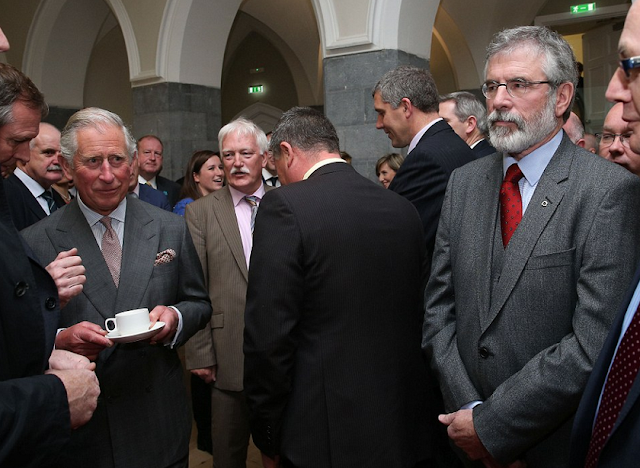 He is the first member of the British Royal Family to meet with leadership of Sinn Féin while in the Republic of Ireland. This image captures Prince Charles as he is approaching Mr. Adams. While it may very well have been tea time and the Prince may have desired some caffeine - here his hands should have absolutely not been holding anything. This moment was most certainly highly choreographed - however on the chance that Mr. Adams was standing in an unanticipated location, Prince Charles should have immediately handed the cup and saucer off - so that both hands were empty upon initiating any greeting or handshake. Holding any object in front of the chest or abdomen upon meeting another person is an example of a MAP surrogate (Manipulator, Adaptor, Pacifier) - and indicates a low degree of emotional comfort. The drink and its container act as an insulator/blocking agent from that which gives the Prince anxiety. Moreover it also telegraphs disrespect and a low priority nature to the meeting. Gerry Adams is displaying body language known as a "Fig Leaf" or "Genital Guarding". In this context it is indicative of either lower emotional comfort - or respect shown to a recognized alpha by a self-acknowledged beta (e.g. a former U.S. president would also stand similarly next to a current president during a speech - or me, if I were also meeting Prince Charles). Thus on occasion (a small minority of the time) the fig leaf is an example deliberate, conscious etiquette behavior. What other nonverbal displayed here by Mr. Adam tells us which of these two is correct in this moment? Nonverbal Communication Analysis No. 2202: Barack Obama and Hillary Clinton and the Body Language of the "Fig Leaf"